Word of the Justice League's impressive reputation has spread everywhere, even within the boundaries and past the defenses of the secret cult headquarters of KOBRA, where followers whisper to each other in bated breaths their fear of being unearthed by the League. Weeks later, in Central City, the Flash rounds up a gang of armed criminals robbing a bank by racing around them fast enough to generate a whirlwind. The crooks go flying into the air only to come back down hard on the concrete. Soon afterwards, the bank president approaches the Flash to thank him, but upon grasping the hero's hand in his, the president hits the Flash's leg with an electrical staff that incapacitates the Scarlet Speedster. The bank president then reveals himself as King Kobra and, for his next trick, sends a missile with nerve gas into a nearby buildings. The Flash watches helplessly as the gas spreads amongst the crowd. When the League finally arrives to lend their assistance, a doctor speaks with Batman, informing the Dark Knight that the victims of the gas have only 48 hours to live unless an antidote can be appropriated. Superman, meanwhile, has gone looking for a sample of the gas so that the scientists can begin work on trying to concoct the antidote, but when he reports back, he reveals that his efforts have been in vain and that the only things he found was a titanium case that survived the blast; inside is a message for the League from King Kobra, insisting that Green Lantern and Hawkgirl accept a duel against himself and Lady Eve at the Grand Canyon by noon of that day. If they don't arrive, or if any of the other League members join them, another canister of nerve gas will be released in a school yard. 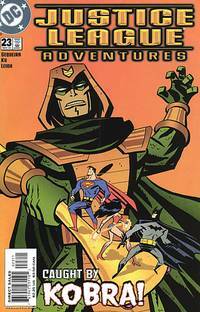 When GL and Hawkgirl arrive, they notice first that news reporter, Snapper Carr, has been abducted by King Kobra and that he is there to document what the cult leader plans to be the downfall of two of the League members. A battle ensues in which GL and Hawkgirl quickly get the upper hand against their two opponents, but it turns out to be not enough when King Kobra releases a second, more powerful dose of the nerve gas from his costume that immediately engulfs the two heroes. He escapes with Lady Eve and his followers as Superman and Wonder Woman arrive at the Canyon with an empty canister they had found hidden in a nearby school yard. Back at the Watchtower, the League takes account of their progress against King Kobra so far, realizing that they are now operating at nearly half strength, with three of their members incapacitated. As the group talks strategy, J'onn J'onnz picks up a presence within his mind that suddenly overwhelms him, and at the next moment, King Kobra himself walks straight into their headquarters, sits down in one of their chairs, and directs their attention towards the monitor. Knowing that King Kobra is the only one with the antidote capable of saving Green Lantern and Hawkgirl, the Leaguers grudgingly watch the screen. What they see is the interior of the Colliseum in Rome, Italy, where Lady Eve and a legion of KOBRA's finest troops stands ready to execute a group of hostages and release two missiles filled with nerve gas to targets at opposite ends of the world. The only way that the hostages and the targets will be spared, King Kobra reveals, is if Superman and Wonder Woman defeat his soldiers in battle. He then teleports away, leaving the Leaguers ready to race off again until Batman decides that they've been playing King Kobra's game for too long. Later, Superman and Wonder Woman arrive to battle the troops and are quickly felled by energy blasts. King Kobra laughs in joy at the ease of his victory in front of both his troops and reporters, who are beaming records of the incident across the world. And that's when Batman steps in. The Dark Knight challenges King Kobra to a fight- a fair one. When King Kobra hesitates, he sees for once that the tables have been turned. If he doesn't fight, he will be discredited by both his followers and the media reporters, who have their video cameras aimed at him, recording his every moment of apprehension. He accepts and a fight ensues that quickly claims the Dark Knight as victor. No sooner has he won, however, than King Kobra orders the assistance of his second-in-command, Lady Eve, to blast the Dark Knight with her energy cannon. Batman takes the blast, falls, and stands back up again, unwilling to be defeated so easily. Furious at the way things are suddenly transpiring, King Kobra fires off the two rockets filled with nerve gas. Superman and Wonder Woman suddenly spring up, having only faked their defeat earlier, and while Superman races after the missiles, Wonder Woman ties up King Kobra with her lasso and rips apart KOBRA's defenses. Then, the Amazon warrior approaches a camera and speaks to her audience, reassuring them that KOBRA has failed and that even now, the Flash is tracking the two missiles and Martian Manhunter is beaming their coordinates telepathically to Superman. Although the Man of Steel doesn't have enough time to reach both missiles, he is able to hurl one missile at the other, exploding the both of them and effectively ruining KOBRA's terrorist agenda. Before turning the missile on the other, Superman even removed the gas from it, so that scientists can begin to work on finding an antidote. In a last, desperate effort, King Kobra demands that Lady Eve lead the troops to attack. Lady Eve refuses however, taking the opportunity to escape with the cult and leave the former leader to take the fall. Story - 5: Great issue! A captivating villain from mainstream DC continuity faithfully represented and translated into the animated universe and a compelling story with undertones of a post-9/11 world make this a definite read. Additionally, each League member gets his or her time to shine and the dialogue and narrative flow match the best of any of the animated episodes. Buy this issue now! Art - 4: Min does some nice work on this issue. I especially enjoy his battle between Batman and King Kobra and his depiction of Green Lantern and Hawkgirl battling the villains on the Grand Canyon. However, there are a few pages that have been inked too blocky, causing a stiffness in Min's pencils that is not usually apparent. Leigh, for the most part, does a nice job, but his work over Min's penciled Superman and Wonder Woman (especially in the Watchtower sequence) leaves much to be desired. Cover Art - 5: Terrific! It has a bit of a Mike Mignola flavor to it, which I like! I don't know who Wight is (and they don't credit him in the book), but he did one hell of a cover! And no annoying Cartoon Network banner, thank God!